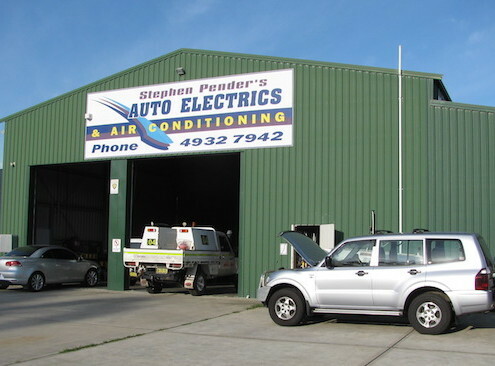 Stephen Pender’s Auto Electrics and Air Conditioning is one of the Hunter Districts premier automotive specialists service centres. Pender’s Auto Electrics specialise in car, 4wd, truck and marine auto electrical, air conditioning. Our well equipped workshop allows us to diagnose and repair your car quickly whether it be a late model or an early model vehicle. Look under the bonnet of any modern motor vehicle and you will see how much technology is being used to improve performance whilst putting less stress on the environment through reduced fuel consumption and exhaust pollution. Today it requires an expert with approved knowledge and skills to service this level of sophisticated automotive technology. The combination of know how, technical experience, well equipped workshop, quality parts and components are the basic ingredients to keep your vehicle friendly to the environment and performing to the optimum level by the vehicle manufacturer. Stephen Pender is regarded by his piers to be one of Australia’s leading Automotive Service Technician. Yes we can service, repair or carry out installations to your car, 4wd, truck, trailer, caravan or recreational vehicle.